Wells voters cast their ballots at Wells Junior High School. 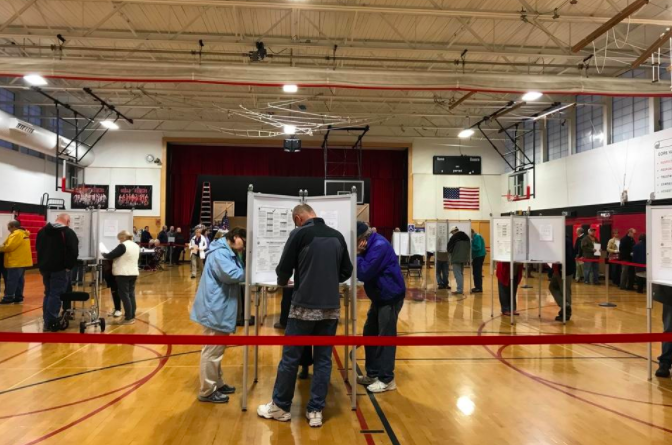 WELLS , Maine — Voters gave the Wells Board of Selectmen the go-ahead to consider an alternative site for the town’s new fire substation to be built. By a vote of 4,709 to 1,070, voters handily approved Question 2 on the local ballot during the election on Tuesday. As a result, selectmen will now determine whether the parcel of the public works garage on Route 9 on North Berwick Road is preferred for the substation over the site on Route 109, near Meetinghouse Road, that voters approved for the project during the Annual Town Meeting in 2017. Proceeds of the $13.25 million in general obligation bonds that the town issued last November could be used to pay the costs of building the new substation at the Route 9 site. Selectmen will determine whether those funds will be used if they conclude that a new substation at that site would be more beneficial than one at the original Route 109 location. Selectmen will determine that the public works site is preferable if construction there would be less expensive, if utilities there were more efficient, and if an “equal or improved public safety response” could be provided to the community. The selectmen decided to have the question placed on this week’s ballot because they agreed that it would save on expenses to have the substation built during the same timeframe as the town’s new, larger public safety complex, which is currently under construction on Route One. Warden Kerri Von Schaak released the Wells results once they were tallied after the polls closed.